Glaucoma is a disease that injures the optic nerve, causing progressive vision loss. Glaucoma is a major cause of blindness in the United States. If caught early, glaucoma-related blindness is easily prevented. However, because it does not produce symptoms until late in its cycle, periodic tests for the disease are necessary. Glaucoma is usually associated with an increase in the pressure inside the eye, called intraocular pressure (IOP). This increase occurs in front of the iris in a fluid called the aqueous humor. Aqueous humor exits through tiny channels between the iris and the cornea, in an area called the trabeculum. When the trabeculum is blocked, pressure from the build up of aqueous humor either increases rapidly with pain and redness, or builds slowly with no symptoms until there is a significant loss of vision. Trabeculectomy is the last treatment employed for either type of glaucoma. It is used only after medications and laser trabeculoplasty have failed to alleviate IOP. Glaucoma can develop at any age, but people over 45 are at higher risk. African Americans are more likely to develop glaucoma, especially primary open-angle glaucoma. Other factors, such as a family history of glaucoma, greatly increase the risk of contracting the disease. Diabetes and previous eye injury also increase chances of developing glaucoma. 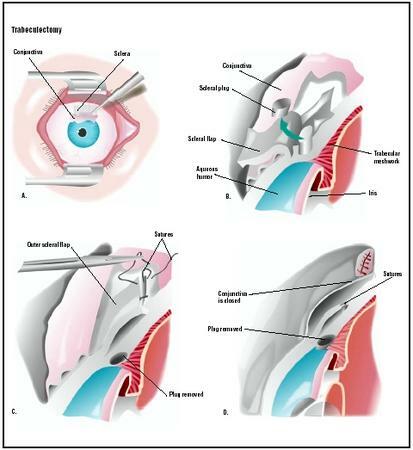 where the cornea connects to the sclera, to create a flap that allows fluid to escape the anterior chamber without deflating the eye. The area is called the trabeculum. After the procedure, fluid can flow out onto the eye's surface, where it is absorbed by the conjunctiva, the transparent membrane that lines the sclera and the eyelids. Sometimes, an additional piece is taken from the iris so that anterior chamber fluid can also flow backward into the vitreous. This procedure is called an iridectomy . The procedure is fully explained and any alternative methods to control intraocular pressure are discussed. Antiglaucoma drugs are prescribed before surgery. Added pressure on the eye caused from coughing or sneezing should be avoided. Several eye drops are applied immediately before surgery. The eye is sterilized, and the patient draped. A speculum is inserted to keep the eyelids apart during surgery. Eye drops, and perhaps patching, will be needed until the eye is healed. Driving should be restricted until the ophthalmologist grants permission. The patient may experience blurred vision. Severe eye pain, light sensitivity, and vision loss should be reported to the physician. Antibiotic and anti-inflammatory eye drops must be used for at least six weeks after surgery. Additional medicines may be prescribed to reduce scarring. Infection and bleeding are risks of any surgery. Scarring can cause the drainage to stop. One-third of trabeculectomy patients will develop cataracts. Trabeculectomy will delay the progression of glaucoma. In many cases, people still require medication to lower IOP. Trabeculectomy is considered a safe procedure. Infection is a complication that could lead to more serious medical problems; however, it is controllable with eye drops. Physicians will first try to lower IOP with glaucoma medications. Several types of eye drops are effective for this use. Sometimes a patient must instill more than one eye drop, several times a day. Compliance is very important when using these eye drops; missed dosages will raise IOPs. Lasers are now used to treat both closed-angle and open-angle glaucoma. Peripheral iridectomy is used for people with acute angle-closure glaucoma attacks and chronic closed-angle glaucoma. The procedure creates a hole to improve the flow of aqueous humor. Laser trabeculoplasty uses an argon laser to create tiny burns on the trabecular meshwork, which lowers IOP. The effects, however, are not permanent, and the patient must be retreated. Transscleral cyclophotocoagulation treats the ciliary body with a laser to decrease production of aqueous humor, which reduces IOP. A tube shunt might be implanted to create a drainage pathway in patients who are not candidates for trabeculectomy. Sardegna, Jill, et. al. The Encyclopedia of Blindness and Vision Impairment, 2nd ed. New York: Facts on File, Inc., 2002. Vaughan, Daniel, Ed. General Ophthalmology, 13th ed. Stamford, CT: Appleton & Lange, 1993. "Glaucoma Filtration Procedure." EyeMdLink.com . [cited May 18, 2003] http://www.eyemdlink.com/EyeProcedure.aspEyeProcedureID=44> . Ophthalmologists and optometrists may detect and treat glaucoma; however, only ophthalmologists can perform surgery. Ophthalmologists who are glaucoma subspecialists may have an additional two years of fellowship training. The outpatient surgery is performed in a hospital or surgery suite designed for ophthalmic surgery. Will IOP-lowering medication be needed after the surgery? How long will it take to determine if the surgery was a success? Can cataracts be treated in conjunction with glaucoma surgery? When will vision return to normal? I had a trabeculectomy about 4 months ago. I have develped something ( a place above the bleb) that is causing inflammation and eventually severe pain where I have to go to emergency room. the Doctor who did surgery keeps prescribing steroid packs but pain and swelling keeps coming back. What in the world is causing this pain? I really can't live with it, it is so bad and the steroid packs are terrible. I am wicked on the steroids. I'm getting ready to have this surgery because the laser didn't work, drops (several don't work). I am so afraid of complications due to inflammatory because I use Pred-Forte which is a steroid drop and I still have pain and inflammation along with pressures in the 30's. After the surgery, I will probably be on the pills too. They make me wicked also and overweight. There has got to be a better solution. I'm only 42 and I'm losing my zest in life. I had trabeculectomy drainage in january, its now june and i resently went to A n E with pain in my eye, inflammation was low pressure was 10 before my sergery it was 52, they upped my pred forte too 4 times a day the pain has subsided so it must have been because the pressure was low,there is still a dull ache, i have a out patients appointment in 3 weeks so i will know more then,My post operetive was for about 10 weeks before i started to feel better a long time but worth it to save my sight. I had a trabeculectomy done almost three wks. ago. my right eye pressure was 38, and my left eye is still 33, so I will have to have the left eye done as well. I have had all laser treatments, which didn't work for longer than two years. My pressure in the operated eye is 11 post -operatively. My eye looks diferent than the other: it droops a little, but not much. Where do you go to have the droopy eye corrected, and who does the surgery. I don't know if I want my left eye done, but I will need to save my sight, so i will have to. i have recently had a trabeculectomy on my left eye. make sure that pre operation you ask lots of questions as most of the time they only tell you the bare minimum. I had a lot of pain for week after op and my sight was awful for 3 weeks. However it has improved a lot in last two weeks pain nearly all gone and sight almost back to normal. Pressure down to 12. I did hace v low pressure post op, which led to choroidal leak and black lines, another issue they fail to warn you about, all gone now. I recently had trabeculectomy performed on OD at Wills Eye. Pressure was 40mm/Hg post-op with meds. Post-op IOP is 10 - 13 mm/Hg, great success. Vision is a little blurry, did form cataracts, consistent with first degree relative Hx. OD requires no drops, however, close monitoring is indicated. I just had this surgery 3 days ago, nothing was explained to me at all, so I didn't know what I was in for. I am in terrible pain and just read what they do to you, my eye and nose are running and, I now read I could be in troube with inflamation. I don't think I would have done this if I had known what in entailed. |My pressure was never above 24 and it was lower when I went to the cararact surgeon. I am now wondering if I needed this surgery at all. I had this surgery two years ago on my left eye. I had to have an emergency surgery because I had eye pressures of 65 in the left and 56 in the right. My left eye suffered nerve damage before the surgery because of glaucoma. With the use of drops, the doctor decided not to operate on the right eye (the good eye). Unfortunately, the drops are not keeping the pressure down. I am scheduled for my second surgery but this time on the right eye. I had a successful experience the first time. I pray the second surgery will be as well. I had the trabeculectomy surgery but the pressure is still high and my right eye is droopy.What can I do about the droopy eye my pressure is 21 in the right eye after the surgery.I,ve been on the pred forte almost a year now is this normal. It has now been 4 weeks, since I had my Trabeculectomy eye operation, I am still in pain, and it is red, I don't have my sight back, can anyone tell me how long you have to wait before this situation clears up. My surgeon did not explain anything to me as well he is very abrupt, i find him to be very rude. My vision was 20/25 before operation and my pressure was 20, I don't understand why I had this operation. Please can anyone ease my anxiety. Firstly for those of you experiencing discomfort and pain, my heart feels for you and I hope that things improve soon for you. I am aged 48 with a family history of Glaucoma, as with my dad before, my eye pressure has significantly increased in recent times in my left eye. Three months ago it was around the 60 mark. After trying many different eye drops to try and control the pressure it was decided by my ophthalmologist that I should get quickly into theatre for a trabeculectomy. I was most comfortable with the idea as my dad had been there some 30 years ago. At age 81 he is still driving around and has decent vision in his right eye. Losing the sight in his left eye is what sadly alerted him to Glaucoma. I was happy to nip this in the bud before any loss of vision and was determined to learn from dads experiences and lack of education in this area. My trabeculectomy took place one month ago, a couple of days after finding these pages in fact, the experiences of others here did set my alarm bells ringing but I took the view that either i proceed or start to lose sight. One month after the operation I am still surprised how, in my particular case, I felt no pain whatsoever right up until now. My sight today is a little blurred and I hope for it to improve. It’s about 90% of what it was and i hope for some more improvement to come my way, afterall my operation was only 4 weeks ago now. Either way if I stay with what I have today then that will be ok when compared to walking around with eye pressures of 60 which was leaving me in a constant state of panic. Good news, my understanding is that there is soon to be an alternative to having a trabeculectomy, run a Google search using " iStent implant " as your search term, iStent is being pioneered in the UK today. While I have your attention may I just say that "Moorfields Eye Hospital" in London, England have been outstanding in my books. They have been looking after me for over 20 years now and Im most grateful for all of their help over the years. Best of luck to you all, don’t be afraid and remember that you are doing what needs to be done in order to preserve your site for tomorrow. kinds of drops failed to bring the pressure down. Surgery for my other eye is scheduled for Sept. 14th. read. Let's hear from others who have had better results. I have had two trabeulectomies, one on the left eye in September 09 and the right eye February 10. The left eye had several leaks, but was fixed with little or no complications. The right surgery was successful, but six months into the recovery the bleb developed scar tissue, and therefore required needling. Almost two years have passed and I still have pressures under 10, which is amazing. The only complications that I have had have been corneal abrasions from the needling. I am currently wearing a bandage contact lens on the right eye, but am drop free. All in all anyone who requires this surgery should have it, afterall glaucoma can cause us to go blind. I'm due to have the operation next Wednesday at Bascom Palmer in Palm Beach Gardens. I dread the problems of one eye with high IOP, but since the right eye is unaffected, I feel okay that I still have one good eye left. That said, I haven't even been offered the option of laser surgery and now wonder if I'm rushing in prematurely. I had the op done on Thu, 2 days ago. Just found this site and it's amazing how each individual is different. Doc decided on the op because of increasing pressure, low teens a year ago to 30 just before the surgery. Laser and meds didn't work and I experienced vision loss. So far it's been answered prayers. Some discomfort, but I wouldn't call it pain. Vision was bad before and after a couple of days it's still the same. The eye is red, co-worker told me it's perfect for Halloween next week, it does look scarey. Pressure is down to a 7. Today he checked it again. First reading was 14. Doc pressed just under the eye and did a second reading, a 7. Hindsight, because of the vision loss I should have asked for the op sooner. My right eye, 20/25 corrected, pressure is in the mid teens. If that starts going up, I'll ask for surgery ASAP. At 63, I'm still working as an accountant. It's slow but I can do it with one eye, but can't if the good eye goes bad. Praying complete healing for everyone on this thread. Aloha Ke Akua. I have just had emergency laser surgery to relieve pressure due to glaucoma. Don't know what the future will hold but am grateful to the person who helped me in my time of need. Aren’t us human’s marvellous creatures? Pity we could not all help one another instead of the mindless and senseless stupidity we see around the world. I had a trabulectomy about 6 weeks ago. Two weeks after the surgery I had to go back and have laser surgery to loosen the stitches. Three days later I had to go back to surgery to loosen more stitches. I developed a large white bleb over my iris which seems to be moving down. I just came back from the surgeon and another stich was sticking out causing pain and he removed it. He put me back on an antibiotic and I have to put Pre-Forte in my eyes five times a day. I really regret that I even had the surgery and the whole situation is making me very depressed. I fear that the white bleb will eventually cover my entire eye of which I can accept; however, I think I would have rather lived with the high pressure in my eye since I had no sight in the eye anyway. I am grateful for the website and happy for those who had a good experience. my husband has had laser to lower IOPand it has. down 10in one eye 11 in the other with drops it has held. But with new feilvision test they say he needs the trabeculectomy. I was sure onces the IOP was lower you stop the vision lost. I had a Trabeculectomy in 1994 when I was 27, I'm 43 now. It saved my sight. That and a whole load of prayer. My pressure is now stabilised at 10. At time of surgery it was out of control at 56. Stats show there will always be a small percentage of people who develop complications with any surgery. If you trust your doctor's advice, then just relax,do everything you're instructed to and pray loads! Did any one get a second opinion before having the surgery? I'm in my late 30's and next week will be 2 months since I've had trabeculetomy. I've had bleeding, swelling, discomfort, pain and itching up until about a week ago which is the most normal my eye has felt since the surgery. And it's still not 100%, but something tells me this is as good as it gets. I now go for follow-ups every two weeks instead of every week. I am currently using the pred-forte every hour, per doctors orders of course. I am very concerned about the greyish discoloration on my eye, and the droopiness. Are the discoloration and the droopiness permanent? I had trabeculectomy in March, 2010. After many follow-ups, I was told by my doctor that I had too much damage and that this surgery was unsuccessful. I do develop bad headaches and still continue to work in an office where I'm on the computer keying away. I have noticed pain, blurry vision and see the actual lens (cataract) that doctor put in and cannot really see good out of this eye. I also have high pressure in my right eye but won't even think of having this kind of surgery again. I wish I would have never had it done. Now I have a doctor's appointment Monday to see if I can get a letter for light duty and be placed another department where I don't have to be on the computer 8+ hours a day (overtime since tax season is here). I feel like when I look up in a hurry or sideways that I find it very painful and notice that my right eye is taking the whole strain of my left eye. Guess I'll have to see what my doctor says on Monday. Good luck to you all who are thinking of having this kind of surgery done. But please do your research, because it is quite a struggle to see after this surgery. I had a trabeculectomy 9 months ago.Doctor said I got glaucoma as a result of taking prednisone(solupred) for treatment of ulcerative colitis.Now I see like a tearing/opening in the top periphery of my iris beside the operated area(triangular).I went to an ophthalmologist to check that tearing/fissure making an opening in my iris, and I was told it's a result of trabeculectomy and not to worry about it. Can you please tell me if that's normal? ?Why now am seeing that tearing of iris? Is it serious?Can you please explain what happened to my iris? I've had Trabeculectomy 1 month ago and the Dr. checked the pressure of that eye is now 11, it was 31, what is the normal pressure? I had a trabeculectomy on my left eye after a few years of using eye drops to control pressures was not effective anymore. After surgery too much fluid leaked out causing eye ball to collapse. Second surgery put fluid in to put shape back to normal. Pressure went way up, extreme pain, opening had become blocked 70+ pressure, doctor cleaned opening and immediate relief. I have blurred vision in the eye but can still keep my commercial drivers medical card. Eye has irritation due to dryness in the eye, not constant but sporadic. Bright light irritates the eye. But I can still see through it. Three years after surgery on left eye the right one needs same thing. Doctor recommends a canaloplasty. Insurance denies payment but I do it anyway since have so many issues with the other procedure. It turns out perfectly. No side effects and normal pressures for 15 months now. In my third appeal with the insurance company (Anthem Blue Cross). I'm 54 in good health otherwise. One other note is I was adopted so have no family history of medical issues. It may have helped to know but the social system does not allow me access. Too bad, it may have helped me be more preventative with some of this. June 27, 3rd post surgery check up - contact lens remove and - eye pressure at 10!!! June 30, 4th post surgery check up - 1 suture removed and eye pressure at 14. eye drops every other hour. MY 7 YEAR OLD DAUGHTER HAD TRABECULECTOMY SURGERY ON BOTH EYES. bUT NOW HER EYE PRESSURE IS 5 IN ONE EYE AND 16 IN THE OTHER EYE. WAS TOLD THAT SHE HAS FLUID AROUND OPTIC NERVE AND SWELLING ON OPTIC NERVE. WHAT DOES THIS MEAN? i had trabeculectomy 3 months ago and after 4 weeks had bleb leak. all was fine until resuturing and now in constant discomfort . my consultant has dismissed my pain and said see you three months. vision poor .ache and watery eye .pressures normal at 15. if eye not red you are told go away your fine. guess they just dont know sometimes .it is a long process and may not go back cant put life, work on hold any longer. u can outlive bad effects of glaucoma, surgery should be carefuly considered . It's been two years since my left eye trabeculectomy. Healing went well, and now with continued use of drops, the pressure is stable in the tweens. Question is this: I am hankering to do adventures like hot air ballooning and skydiving - items left on my bucket list. Is there any reason to fear the change of altitude and pressure will affect the bleb? Does anyone know of a friend or relative with similar experience. I am happy with my eye and don't want to blow it, but life is short and adventure is beckoning!! My glaucoma was caused by a football injury 40 yrs ago. Drops controlled the pressure except for 1 pressure spike until a year ago when I had an allergic reaction to Combigan. The pressure spiked to 53 & 60. Laser created holes & an Iridectomy failed. A Trabeculectomy was successfully preformed on the left eye in Jan 2011. Pressure stays between 13 - 17. Fast growing cataracts formed in both eyes and the cataract surgery was successful. The vision that had been practically lost in the left eye for a couple of years has returned to a large extent... amazing. The right eye pressure dropped and remained low at 15 for most of the year but started to increase to 27 by the end of the year. I opted for a Trabeculectomy 4 weeks ago, Oct 2011. The pressure is up to 6. My personal opinion of the droopy eye is that there is an inside ridge under the eyelid, much like a windshield wiper blade. My opinion is that this ridge stops the eyelid from fully opening when it nears the bleb formed above the cornea. It's a small price to pay to enjoy the benefits of a stable reduced eye pressure and no more drying & irritating drops, which at last count was costing me $1,800/year. My biggest negative is the loss of my job because I was unable to see correctly when returning to work and the time I have to be off work without income while I wait for this eye to heal. I have work waiting and anticipate another 6 weeks before my vision stabilizes. No pain to speak of in the healing process & no complications to date. I had the surgery on one eye almost two months ago. It has brought the pressure down from 42 to a steady 14 after all else failed and some damage had already occurred. The other eye is sitting in the low 20's with drops. If it ever goes the same way I'd be very reluctant to have the same procedure. My opthalmologist tells me the bleb looks perfect, very diffuse with no scarring, in other words a fantastic outcome. But, my eye is constantly irritated and sore, with the soreness concentrated in the inner corner and around the bottom rim. At times it feels very raw, and I feel like my life revolves around the discomfort. Lubricating drops only help for short periods. The doc keeps telling me there's no reason for it and no sign of corneal irritation. Has anyone else had this outcome? I find it exhausting and depressing. i am 4 months now since trab, i also have niggling ache and discomfort . doc put me on anti biotic drops just incase. they do seem to be reluctant to admit some people do hav pain and discomfort.wonder why that is ?. many times i am told there is nothing wrong all is good, but i still get spasms of pain or twinges. finaly aftr all that , my bleb thin and iop dropped suddenly went back and they may redo op . told them was a problem all along .hang in there anne, most of us will have ongoing discomfort . again so many of us ask why. why have a trabeculectomy? well u shouldnt . personally at 45 now 4 evr will b at outpatients .infections .drops multiple and constant .complications numerous .discomfort .etc.etc wont live to 65 and know wouldv not lost total sight .now 20 years control eye hospital .dont do it if young .this bleb wil honestly not help any way . Seven months after my Trap. I still have pain in my eye, it also feels dry and like I have something in my eye. My Dr. keeps telling me the pain is not from the surg. I think it is, if I had it to do over I would not have this surg. i too am seven months after trab with pain and discomfort. my doc said it was sinus but went back AGAIN and had to get anti inflamatory drops . have constant dry eye and pain , dont know why they say nowt wrong , must be a reason .am fed up .no way am i getn other eye done. even dwp medical think a trab is minor.why bother.i too think it not worth it .insist on upping the drops .not surgery. Just had my trab + cataract surgery on Jan. 9. From everything I've read and been told, I'm doing about as well as could be expected. They sure don't tell you all the details about recovery, do they? Makes you want to see them undergo a trab. But there's no point in them scaring or upsetting you ahead of time. After all, it's either surgery or eventual blindness. I'd heard such wonderful stories about bright, clear vision after cataract surgery, but so far the trab is spoiling it. Vision is way more blurry than before surgery, and that plus the irritation from the stitch(es) is making me frustrated, nervous, and generally miserable. But my biggest complaint is the blurred vision keeping me from driving. I hadn't planned on having to ask for rides to the doctor so often and taking 3 hours out of my son's busy day each time. I'm hopeful about a good outcome but dreading getting the other eye done. My doc is one of those who did original research and studies on the iStent. I was hoping to get one of those instead of a trab, but the FDA is being slow with its final approval (supposedly coming "any day now"). I had a trabeculectomy in my right eye on 11 Jan and am pleased to say that so far things are going well. My main complaint is blurry vision. I know it's early to judge its success, but hope for the best. Lots of people question what is a good pressure, but it's not a simple answer. Mine have normally been in the 14 to 18 range for both eyes, which for most people is good. However the surgeon says some people still have vision loss with fairly low pressures, which was happening in my right eye, although left eye is OK. I feel bad for those of you who are experiencing pain and other problems. It's bad enough worrying about whether or not we'll lose our vision. i had trab few months ago and have ongoing problems. leaking bleb , infections and dry eye .i visited eye hospital with pain and a dent in my iris . it comes and goes very quickly .the docs were unsure, said it may be a drop in pressure occasionaly and put me on anti biotics. anyone had these dents appear ? I had one done about a year and a half ago on one eye and just had one done on my other eye. We had tried all of the types of pressure-lowering eye drops and had found that each has its own unique major-league negative side-effect. The first trabeculectomy was very uncomfortable for a few months, and remained at a mild level of discomfort for about a year, but the pressure has stabilized at around 11. The second one, 6 days ago, is surprising in its lack of discomfort. Vision won't return to normal for a while, but I am able to drive again. My best wishes to all who are thinking of this surgery - my your surgeon be as good as the ones I had and may your eyes have all of the right characteristics for a successful surgery. My bleb moved down to the outside corner of my eye and is causing such a high level of pain it is intolerable. Has anyone had this happen, or know what I can do for the pain. Nothing my Doctor suggests helps with the pain at all. Was hoping to find help here but no one has mentioned this problem. Last April I had the trab in the right eye; prior to I had the left eye done with the same procedure. Now a year later I am told that since the pressure has risen from a stable 12 and is now 21 I need to undergo a needleing procedure to open the drainage sight and reduce the pressure. I am so scared as the previous trab was horrible with terrible blurred vision for a month. Please advise if you have had this procedure. I am one week and one day since my trab surgery on my right eye. There has been little to no pain since the initial pain immediately after the surgery. It is pretty annoying having the blurred vision in that eye but my doctor tells me that is pretty normal for the first few weeks. I made my own eye "patch" (black paper over the right lens of my glasses) to help me to be able to see in my everyday activities. Going outside in the sunshine is painful though, even with sunglasses. Before the surgery I was fairly anxious about having surgery done to my eye but was also sure that without surgery I would go blind in that eye. There has already been some damage to the optic nerve and a slight amount of vision loss. Right now I am age 57 and looking forward to retirement in a few years. Being blind is not how I want to "enjoy" my retirement. So far the Doctor says everything looks fine. I am hopeful that it remains that way and the Trab surgery will be successful. I had a trab 6 months ago. I had normal pressure glaucoma or so they told me after getting 3 different diagnosis for a blind area in my left upper eye. One said epiretinal membrane,one said no epiretinal membrane but beginning cataract. An opthalmologist diagnosed me with glaucoma. My eye pressures were 18 and 19. I questioned him because of the shape of the blind area - like a cloud with a tornado coming out of it and also wondered why none of the optometrists that performed my previous annual eye exams diagnosed glaucoma. I don't feel that I got an appropriate answer. He just repeated "You have glaucoma." No one in my family ever had glaucoma. I am very unhappy with the result. The surface of my eye is so puffed out that the iris is indented and there is constant irritation. I do not recommend this surgery to anyone. My life has changed for the worse. I would rather have lost my vision in that eye than have this constant irritation and distraction. I have been blind in my right eye since infancy due to a large tumor on my right eyelid that kept the eye closed and the optic nerve pathways never really formed. I was diagnosed with glaucoma when I was in my early 20's and have had great success with medicinal management until now. I've even been fortunate enough to have a rather tough optic nerve that tolerated pressures of 25, but now I can't get the pressures down below 30 in the good eye and I'm told today that I've started showing signs of vision loss in the lower portion. The doctor is strongly recommending the trabeculectomy, but oh God, I'm terrified! I don't have another eye to depend on if this should go awry and could be blind for the rest of my life. On the other hand, I'm still losing vision anyway and it's now a matter of being blind sooner versus later. I'm only 50 and can't imagine the rest of my life being unable to work or drive. I had a trabeculectomy back in July. My Doctor who I met for the first time told me I needed to schedule surgery immediately. I've never seen this Opthamologist before. I had the surgery with very little information regarding the procedure, how foolish on my part. Since the surgery I have no vision in my right eye, my pressure is 0 and my eye has imploded and I've developed fluid build up in all four quadrants in my eye. My Opthomologist who did the surgery has performed several procedures to correct this problem of vision loss, however he was unsuccessful. My vision was excellent before surgery and my pressure was 17 why did he need to perform this procedure so fast? He did'nt even try drops before hand nor did the conversation arise of alternatives. Just straight to surgery and if the Doctor screws up we'll call it a complication. Thanks Doc! Please seek second opinions, ask questions and do some research on the success rate of your opthomologist. I am a 53 YO F diag w/ unilat adv glauc 6/12 due to PEX. Sig loss of optic nerve & vis fld. Press 50+. Hadn't seen opthal in 4 yrs. Stupid-mom & grndma had same prob. Thought I was "too young" & had NO recog symps. Comb, Trav & Azopt reduced press to 19 next a.m. Rt eye range 12-19 (no damage). Cont drops 4x/day for 2 wks - prss range 19-27. Dr sent me to Duke Eye Cntr. Rec Trab. Said laser would be ineff due to too much dam. Had surg 2 wks later. Post-surg press range 11-4 (leaking bleb 3 wks post). Dr put on med contact - PAINFUL (dry eye). Post-surg symps - blurry vision, poor depth percep, headaches (almost mig), extreme sens to light, dull ache in eye. How long will this last? My dr said range of 3 wks-1 yr. Eye changes shape after surg which can take up to a yr. I know this was the right dec, however. My dr answers ALL ques (which I write before visit) be4 leaving the room. It's YOUR vision! Be aggressive, proactive & do HW on your dr. Will pray for all for best results poss & maintaining what vision we have left. TY for posts. I don't feel alone anymore. My husband is scheduled for a trabeculectomy on Mon. Oct. 1st. He's 50 and he has had glaucoma for about 20 years, it developed after a bad car accident. He currently takes Lumigan, Timoral and one other brand I can't remember of drops a few times per day. His eye pressures range from 12-early 20's. His opthamalogist has recommended this procedure since he is gradually losing his sight and his one eye is very droopy already. After reading everyone's experiences, I am wondering if we are making the right decision to have the surgery. I don't want to see him in pain and miserable, but I also don't want him to go blind. I wish I knew what to do to prevent him from developing cataracts, a leaking bleb and scarring. Can anyone offer any specific instructions how to care for the eye after surgery for optimum results? Is there such a thing? In the mean time I will be on my knees, begging God for a speedy recovery. So sorry for everyone who has had to endure such a procedure. God bless you all! I had a trabeculecyomy in June 2012 at the Universary of Michigan Kellogg eye center. I never had any pain or any problems after surgery. My last pressure in my right eye was 6. I am not on any drops in that eye after surgery. I may have to have my left eye done in the future. I have been on eye drops 3 kind in the morning & 3 kinds in the evening for about 15 years. I have had laser over the years 4 times in each eye. Just thought you should know that I had sucess with my surgery. Nov. 1 2012. I had a Trab about 4 yrs ago w/ post-op side effects that not one doctor told me could happen. I had to have all my internal sutures yagged out due to double vision and a double astigmitisim!!! I had lasix to try to correct my vison. 2 yrs later I had corrective surgery to correct y drooping eyelid. Now I feel like there is a pebble in the upper lid area next to my nose. I put in so much eye drops thinking its dry eye but to no avail. Is it possible that there is a suture that holds my eye lid up that is poking my eyeball??? I have had eye mds look at my eye and was told there was no eyelash growing in my lid. Why do I feel like there is always something in my eye?? Please Help!! Im 48 yrs old. I have had glaucoma since I was in my 30s and it has got worse over the past four years, I am 54 now. I have had trab ops done in both eyes over the past year, last one done a couple of weeks ago. My vision isnt brilliant though am not registered as partially sighted, though on the verge. Sight has got worse considerably since May 2012 and before that I did not notice the sight loss at all and was continuing life as normal. Now things are a lot different and I have lost a lot of peripheral vision in both eyes and central vision in my right eye. I am finding it hard at work now and am doing a fine art degree course, which am finding hard to do also, though have had lots of help put in place to assist me, though I am not sure how long I am able to continue. It is a shame, because I am a very visual person and love art and design. It does seem to suddenly take a turn for the worse, even though you have eye drops, visual fields test etc. It has seemed to happen suddenly for me anyway, and has been a big shock and scarey to lose vision quickly, rather than slowly over a longer period of time which perhaps could cope with better if at a more gradual pace. Had the trabe done 2yrs ago and the express shunt 1yr and 3 mos ago. Ended up with a droopy eyelid don't know if its going to get better. Would have went with the trabe again if I would have known about the droopy eye. Not happy. However no pain in either one. With the express shunt however I have a lot of irritation feeling. He said he could put another stitch in but not if my eye is going to droop more and will the irritation go away. I had trabulectomies done in both eyes over 16yrs ago. First my right eye, but by the time I took action, I was already legally blind in my right eye. I was 22yrs old when this all came down. Just recently they have started to fail and I refuse to get on drops, because I know they will eventually fail too. I have had two needling surgeries done. The first one fail and made the pressure worse (16 to 22) and I go today to see if the second one has worked. I don't think it has because the bleb won't stay inflated unless I push ( massage) my eye. Then it gets very large, but my vision is greatly distorted. Don't let anyone kid you, needling surgery is horrible!! Because of the length of time it has been since my surgeries, the scar tissue is so thick and it's difficult to repair. I was so happy it lasted so long, but who knew so much time would make things worse later. Just bare in mind that just because things seem to be good with your surgeries, ask questions. Don't let too much time pass with "good" pressure readings. Make sure your bleb is working good too. Take care and my GOD keep all of you well. I've just had a trabeculectomy done on my right eye 4 days ago. Yes, pain. Yes, elevated IOP. Have been back to the surgery every day and only now is my pressure starting to fall to acceptable levels. I am expecting things to be tough for the next 4 - 6 weeks, possibly longer. But I am fortifying myself by reading, reading, reading from appropriate sources - ie nothing alarmist, more like medical journals. I can't encourage everyone enough to READ, READ, READ about your condition. Accept NOTHING the surgeons say. Question everything, take second, third and fourth opinions. The medical journals confirm it is the experienced individual surgeon who has many years of experience doing trabbies who offer you the best chance for a successful procedure. Prior to the trab, on initial diagnosis of high IOP (intraocular pressure should be between 10 - 21; anything higher and you will be treated - first for Ocular Hyper Tension, then gradually the doctors might acknowledge you have glaucoma and, as your vision decreases, they will consider surgical intervention). Trabeculectomy is the gold standard, but other less-invasive, more frequently repeatable procedures are offered to older patients, such as Selective Laser Trabeculoplasty. All I can say is, DO YOUR RESEARCH. Know what is happening to your eye! If you've been told you have Ocular Hyper Tension, high IOP or suspected glaucoma, monitor your vision every day! Look for extended blind spots, go for regular check-ups, and take the eye drops scrupulously. Be aware they have sometimes have very depressing side effects. Ask about everything, don't just accept everything your doctors tell you! I'm in my late 60's and told that I need a trabeculectomy with an express shunt for my right eye. I have no central vision in my left eye due wet macular degeneration (wAMD) so I couldn't use it to read, watch TV, drive, etc. My right eye has an IOP of 15 to 16 with using 2 kinds eye drops and a hemorage on the right optic nerve. As I read these comments about eye surgery, it seems that many people have very high pressures. There seems to be lots of pain for weeks and blurry vision after this type of surgery and that some people have complications and others just seem to breeze through. With only one good eye, I'm scared to have this surgery and wonder if it's necessary since my pressure isn't too bad but then I don't want to lose sight in this eye from creeping glaucoma. Any thoughts from anyone? and thanks and good luck with your eye problems. I had a trabeculectomy in my right eye in Sept. 2012, I lost vision for extensive periods of time for 7 weeks and had a lot of problems with this eye. My surgery for my left eye was in Jan. 2013. I did not experience the pain and vision loss in that eye at all. Now I am experiencing what I consider swelling of both of my eye lids, especially of my right eye. I had drooping of the eye lid of the longest time. I asked my surgeon because of the swelling and he told me my eyelid is still drooping, which I do not agree with. When the eyelid droops it is hanging down, my eyelids are at least twice as thick as normal. Also I can see my pupils when I close my eye, especially in the left eye and I experience a lot of tearing, literally tears streaming down my face, the other day a woman approached me because she thought I was crying. I also have a lot of burning in both of my eyes. When I sneeze I am seeing bluish/silver lightning in both of my eyes, or even when I bump my head very lightly. Did anybody else experience these symptoms or know what the surgeon told them. I would be very appreciative for advise. I'm feeling very blessed after reading these comments. I was terrified of having a trabulectomy, but all my fears proved to be groundless. I had the trab on my right eye (my "bad" eye with just 75% vision left) on May 2. I had zero pain, no side-effects at all and my droopy eyelid lasted just three days. My vision is still blurred 10 weeks after the surgery, but it continues to improve. Everything I've read online says that return of vision can take three to six months and so I am not alarmed. My pressure dropped from 16 to 8, and the bleb is healing beautifully. My next trab is scheduled for August 15, 2013. My surgeon has done 2,000+ trabs. Find a specialist. Find someone who will extensively use antibiotics and steroids post-surgery. I am hopeful that I will need no drops at all and that my pressures will remain low. She already discussed future cataract surgery (cataracts generally grow more quickly after trabs) and said that I most likely would not need to wear glasses in the future. If I had known that the surgery was going to be so successful, I would not have put it off as long as I did. I was diagnosed with advanced glaucoma on June 7, 2012. 75% of the vision in my right eye was gone, even though I had had field tests for seven years and my optometrist never discussed them with me or told me I had glaucoma or blindness. The ophthalmologist I saw quickly ordered an MRI (which showed no issues) and upped my one "preglaucoma" drop (according to my optometrist) to three drops a day, then six drops a day and then performed two laser surgeries last August. None of these succeeded in keeping down my IOP. In October 2012, I met with a specialist at Washington University in St. Louis. She added another drop and closely monitored me until surgery became necessary. I stress this again: Do diligent research and find a specialist with a lot of experience!! Hello, I Had my trab right eye 5 weeks ago, general discomfort after op for three days but Doctor said all is well. My problem is when I lie down at night I get severe pain in my eye every hour so only manage short bursts of sleep, this only happens when lying down, have tried increasing pillows but still cannot get a nights sleep due to the pain like cramp in my eye. During the daytime I am pain free and the Doctor says the operation and pressures are fine, anyone else experienced this sort of pain when luring down ? love the site it is so nice to feel we are not on our own. I am 60, and have had glaucoma (technically one does not have glaucoma unless there is optic nerve damage) in one eye and high IOP in the other for many years, but I had exhausted all medical options finally and as I started to lose vision in my left eye, I decided on trabeculectomy with my doctor. As most of you have learned, the procedure itself is very simple, quick, and relatively painless. That part was easy. It is the post op care which is the critical phase. I was doing great for about a week, with only mild discomfort, but was healing too quickly and pressure went up again, so I had one stitch cut in the "door" to let more fluid out and WHOAH! The fluid is now copious, tinged with blood and filling my sclera so that it looks like my eye is filled with bloody tears. I have called the emergency line twice, but the calm doctor on call tells me each time that is NORMAL and not to worry unless there is deep seated pain. So I wait. Gotta make it through the weekend to see the surgeon on Monday. At least it isn't hurting. Just uncomfortable. The surgeon told me to stop the antibiotics and cut the steroids in half to try to stop the scarring blocking the flow from the blob. I am concerned about the lack of antibiotics so soon after surgery. 9 days. I will post again on Monday and let everyone know what he says. This is Ann (69) again, now one month post-trab. Also had one stitch cut after one week. That has all healed up, and everything is doing well. I feel less discomfort now, and have less blurriness, although I understand I will feel like there is something in my eye and have some blurriness for quite some time. I am having no pain at all, and no longer have to use any meds in my treated eye! I am thankful that now I don't have to worry about losing any more vision to glaucoma! To Sylvia, pain after this many months I would say is not normal, and you should see another doctor, I think. I wish you well! had my Right Eye. Trab in June, commented on this site about real pain when lying down, went to hospital Surfeon removed 3 stitches after 5 weeks of pain, pain disappeared over night ! !, carried of doing all the Ored Forte drops and antibiotics and now NO drops at all in the Right eye and pressure is 6 so Surgeon delighted I sincerely hope that now the worst it over as no further appointment for 3. Months so great news and having my eye test next week, my vision is not wonderful in the eye so hoping new lenses/ prescription will be helpful, I am 79 so looking forward to maintaining what sight I have. God Bless to all of you. I had this surgery on both eyes 6 yrs ago. I was 33. I lost my sight over night and had no symptoms apart from headache. I had laser but this didn't work. My pressures were 52 and 58 before surgery. I thank God every day for my sight and the amazing doctor that perfomed my surgery. I still have headaches almost daily. But I feel this is a small price to pay. I am 60 and my IOP is 13 on both eyes. My doctor recommends Trabeculectomy due to optic neve damage. Can somebody advise whether i should go ahead. Thanks. I am 54 & my IOP is hovering around mid 20's. My surgeon recommends me to do surgery for my eyes. My question is what would be a reasonable time break between 2 operations since it is not recommended to perform both eyes operation at the same time. My dad successfully had Ahmed valve implantation in his right eye at Moorfields Eye Hospital in 2008 after subsequent trabeculectomy surgery failed. He had already lost the sight in the left eye when he had the lady surgery. He eventually lost his sight completely about two years ago which was a big blow to the family but what is more worrying is that he is in constant pain, can barely open his eyes and constantly tearing. Is there any solution to this as we are desperate.we need help. I had a Right Eye Trabeculectomy December 24th 2013 and have progressed via check ups via Eye Hospital. I still need to take drops 3 times daily in the left eye which has not developed Glaucoma but is prone to high pressure . I understand that my last eye pressure readings in both eyes were satisfactory. My question is - I have been prescribed Nasonex nasal spray and a friend who has high pressure in her eyes (not glaucoma) was using nasal sprays and she was advised that there could be possible links between the nasal spray and the high pressure between the eyes. I obviously need the nasal spray but cannot help feeling anxious about this. Can you advise please? At the age of 38 I had cataract surgery in one eye, and at the age of 39 I had it done in the other. Why I developed them so early in life is a mystery. Right after the surgeries my eye pressure shot up (I am what is called a steroid responder). For 16 years I battled the drops in both eyes until they quit working. My vision was deteriorating quickly in my left eye so I ended up at U of M Kellogg Eye Center to have a trabeculectomy Sept. 16, 2014. I could hear everything that was being said during the procedure and was surprised by how much of it an intern was doing. I was told she would be assisting. It has been a little over 2 weeks and I ended up going to the E.R. with a leak. A large plastic lens was put over my eye to control the leak. The next day I went back and a different doctor put a larger one on. Then I saw the doctor who did (part) of the surgery and she took it off saying there was no more leak and she didn't like to use the lens. The pain from the stitches rubbing against my eye is unbearable, causes a lot of drainage, and gives me a headache. The pain was too much so I went back and yet another docotr put the lens back on. My pressure has been anywhere from 6 to 20. My vision is still very blurry which I guess is to be expected. I am wearing the Hannibal Lector eye guard around the clock. I'm really not sure how this is all going to end. The pressure in my right eye is on the rise so something will need to be done to that eye in the near future. I am only 54, much to young to be losing my vision. Fortunately I work at a job that is very flexible. I don't know how others could go back to a steady job. Just putting all the eye drops in through out the day takes up a lot of time. Hopefully a new procedure is on the horizon. So glad to hear from actual patients;glad to hear some problems are common after surgery, such as blurred vision, hope it improves soon; had surgery 2 months ago;no pain, just eyestrain. I had my glaucoma surgery last month and now right eyes has become watery after each night sleep. Can anyone advise me. I had surgery 6-9-15 after nine days experiencing leakage and i also have a lot of discomfort I am like everyone else do as much homework as you can before getting into this surgerybecause they really don't tell you a lot so glad to hear from people that you can relate to will keep you posted. i go back to see surgeon tomorrow after 3 wks i had what they call a small leak and is trying a bandage contact len over leak i also have been experiencing watery eye at night since lens was put on also before leak started. john let me know how you made out . Have anybody had any success with a bleb leak now in my 6 wk after surgery. and the pressure coming back. Got to try another surgery which is to install a small tube in the eyes. God bless me and everyone is this forum. Hi john so good to hear back from you and that the leak was fixed i hope the the tube surgery works out for you . I go back on tues 8-11-15 to see if the leak has stopped if not I may have to have surgery to try and stop it . Stay in touch it really helps a lot to talk to someone and i will be saying a prayer for everyone God Bless. Keep me posted . hi everybody my leak was fixed however my pressure was up after removing three stitches have to go back on eye drops it seems as if scarring has taken place i go back to the doctor in four weeks my pressure was 18 after stitches was removed it came down to 12 but went back up after two weeks to 18 so i am back on drops don!t exactly know what is going to take place after four wks if scarring is what making my pressure go up don!t know why he put me on pressure drops seems as if he has to treat the scarring. will keep you posted. Hi my name is Larry charity and I'm 29. I had the trabeculectomy placed in my left eye in April of this year. My eye pressure was 54 and the drops didn't work. The reason why my pressure was up is because I have a condition called sarcoidosis. It is attaching my eye and my joints. Well this is my problem it is now September. I have this sandy feeling and my eye waters like crazy. I don't want to go back to the doc's office. I'm at the point of where I just want to stop seeing all of these doctors. I have a joint, retina, glaucoma, and a lung doctor . Sometime it just overwhelming. I was wondering if anyone has experience this. I had done trabeculectomy for two week on my right eye the pressure was 19 before surgery now I have bleeding for three days (once a day) first day of bleeding it made my heart drop I call emergency right away and they schedule me to see my surgeon the pressure went up to 22 and I have been told this is not unusual everything looks good one stitch left and will remove later, I was bleeding again for next two days I start to pray hope nothing went wrong just wait to see doctor again next week. I had this procedure carried out on the 10th May 2016, three weeks on and all is looking promising. For three years I had been having treatment until the drops appeared to have stopped working(right eye pressure was 37) the procedure was explained fully by the consultant and asked if I had any questions which he answered in a concise and understandable way. First I would like to wish everyone well, this is not a easy problem to deal with, and it is certainly not fair that we have to deal with it, but we do. I am 70 and was dx with glaucoma from imflamatory uvitise at 20. I have been on multipal eye drops 2 to 6 times a day for 50 yrs. 2 wks ago drops stopped working in right eye IOP 51 and sx next day. It has not been fun, there is discomfort, pain, poor vision, dry sandy eyes, and more eye drops. But it still beats the alternatives. Good luck to all. So I was diagnosed in early 2013 with glaucoma (High IOP 28-30) . I had some loss of vision int he right eye at that time, adn was given two different drops. I was monitored at least twice a year at the ophthalmologist office, and it was OK until early 2016. My right eye still showed some loss of vision (vision field exam) and the pressures were typically high teens. My regular opthamologist sent me to a specialist eye surgeon who does surgeries. after the full exam in his office he recommended a trabeculectomy on that eye to try and get my IOP into the 8-10 range, to try and stop further vision loss. I have just had my surgery (surprisingly quick and pain free) , and I have just had my post op visit the day after surgery. My pressure must have been high. The doctor lasered a stitch (I had five sutures) at his office (OWWW it hurt!! Made me jump!! ), then my pressure was 16 after he massaged the eye (sore from the surgery, ugh). Going to see him again later this week for another follow up, taking the steroid drops and the anti-bacterial drops as prescribed. Eye is red, but I can see out of it and only some discomfort from the external sutures, which I'm told eventually I won't notice. I'm young for this (just turned 49), but I don't want to slowly go blind in either eye. If the trabeculectomy works as it should, I will only have to use a drop a day in the left eye, and no further drops int he right. The treb operation may last decades if it maintains correctly. I am going to be taught later how to massage my eye to keep the filter flowing. I had a trabeculectomy on 28th july,on my left eye,but now the surgeon has said istill have bleeding in it. Whenever i get up from being seated and start moving around,the eye clouds up.As soon as i sit down and rest it settles down and i can see ok.The surgeon says it is unusual to be bleeding nearly 5 weeks after the surgery but says it should stop at some point. When is that point ? I was on aspirin which the surgeon told me to stop taking a couple of days after the surgery. I would have thought it might be better to be advised to stop taking aspirin a few days before the surgery. I must say though,that the same surgeon did the same surgery on my right eye about three years ago with very few after effects. I had the trap surgery on my right eye in January and my left eye in March 2017. I am experiencing the same as many of you who have had the surgery. My right eye before surgery had an IPO of 30 and the same for the left after the surgery my right eye has been averaging 11 and my left eye fluctuated from 15 - 10. It's been nine weeks or the RT. I have the burning at night the watery eyes achynes. I had the drooping of the right eye before had left eye surgery now they both seem about the same because I know both are drooping so they pretty much look even now. My problem is is that my vision is more cloudier now my doctor doesn't seem to care about the burning or the cloudiness. He released me back to work. I have anxiety and depression because I'm afraid of losing my work disability income. Has anyone went through this and what happened? I had a trabeculectomy on my left eye on 3/17/17, after a year of different drops, 6 times a day and a laser trabecular surgery on that eye that worked for about 5 minutes. Pressure was approaching 40 in that eye in spite of all the drops. Pressure is now about 10, which is great. But I do have some advice: ask whether you will be fully asleep. I was not and I literally had PTSD for several days afterwards, with flashbacks and feelings of horror. But no one told me I would be awake for the entire procedure and no, it was NOT pain free. Doctor hurt me 2 times and warned me before each time, so he knew it was going to hurt. Recovery was not too bad, minor discomfort and some blurry vision, until he started removing stitches--another thing that had not been mentioned to me. Ask if you will have stitches in your eye that must be removed. I found this unpleasant as well and was in a cold sweat by the time he got the second tool to try to grab the loose end of a stitch off my eyeball. But FAR worse is the visual disturbance that has resulted. No one told me that an iridectomy was going to be part of the trabeculectomy. I am nearsighted, with large brown eyes and I'm not of Asian but European extraction. The hole that was made in my iris -- perhaps needlessly as I do not have closed angle glaucoma -- was done with a scalpel, not a laser. I can find nothing on line about this vision problem with iridectomy, but there are many who are unhappy with the visual side effects of iridotomy. I have to assume they are similar, the only difference being the tool that is used. Last week the eye doctor told me this visual problem -- a brilliant glare that is a blob or 3 lines, that moves with my eyelids when I blink and floats up into my center vision -- is probably permanent. It was not there before the operation. Insist that your doctor tell you if he is doing an iridectomy during your trabeculectomy, and then insist that he give you a rationale. If it doesn't make sense to you, seek a second opinion or simply refuse that part without a REALLY good reason, like you have closed angles or are a closed angle suspect. I have lost faith in a doctor I trusted as a result of this. I've been crying all week, as I let him do this without even knowing about it. And I believe it was unnecessary overkill. It's a terrible dilemma for glaucoma patients because you do have to get the pressure down. Just ask lots of questions. Make the doctor SHOW you what he/she is going to do on a picture or model. If I had done this I might still have the vision I went into that operation with. For some years I hve had normal pressure glacoma, with worsening visual field loss in my left eye (which is my better eye since the right eye is a "lazy eye" that was not diagnosed when I was young enough for it to be treated). Drops, which had worked initially, were increasingly ineffective. Yesterday (a week after my 80th. birthday) I had a trabeculectomy on my left eye. The operation was done under local anaesthetic and seemed to go very well. It was far less horrific than I had feared and I was quite OK just lying still and listening to the background music.This morning, early, I was seen again by the surgeon who was very satisfied with the results so far. Everything was looking good, On returning home I started using the multiplicity of eye drops and got a nasty shock. The Voltarol drops immediately caused a major visual disturbance. The eye went very red and the sight in it is like looking through a misted-up pane of glass. I got on the phone straight away and was told to discontinue the Voltarol and carry on with all the others. That is how things stand at the moment. I'll be seeing him again in three days, so I may put up another comment then. Until this problem arose I was very pleased with the way things were going.. I am just hoping the setback will turn out to be temporary. In spite of everything I can still use ny computer (obviously, since I am typing this myself), so that at least is grounds for optimism. Following on from my last comment, the problem caused by the Voltarol drops went away after 24 hours or so and the surgeon hs advised me not to continue with that one, but to increase the dosage of one of the others instead. Otherwise all is going well. It is early days yet, of course, but I think I am going to end up being pleased that I decided to have it done. I had a trabeculectomy done about 10 days ago. I had very little pain on the day of the surgery. My post op in one week also went well. However, I do have a slight occasional pain. My vision is good so far. I hope the slight pain will go away eventually and the surgery will then be a success. I had high pressures in the range of 30s before surgery and came down to the range of 15 post surgery. This is my old desease .In my left very often brown spots comes and disturb the vision but no pain in it.After 10 days or so these brown spots goes away and vision become clear.I had lacer treatment but still it is happening .You give me some advice what should I do.